Gulls are now returning in smallish numbers, as are Mountain Bluebirds. I hope to see more of these species over the coming weeks. 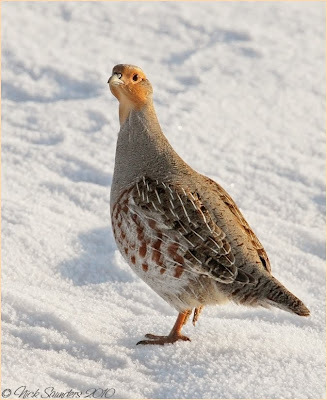 Here are some recent shots of Gray Partridge taken on a back road not far from town. These birds can often be notoriously difficult to spot because of how well they blend in with their surroundings..
Wow breathtaking pictures, especially the second one. The large version in simply wonderful... Birds are coming back slowly over here too, but tonight I'm heading to the volcanic eruption to see if I can see it and maybe take some nice pics! Great shots of a handsome looking bird. I have only seen them at dusk when you can barely distinguish them from their suroundings. Wonderful shots Nick, these Grey are getting rare over here now unfortunately. 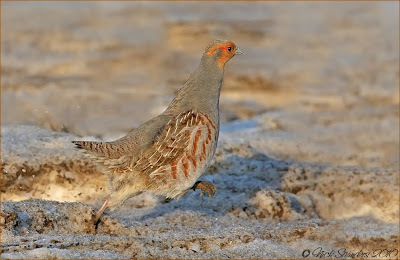 Mainly Red-legged Partridge. Excellent shots Nick. Love the second one. What a cool bird. I love both photos, but I really love the feet action in that first photo! I've never seen one in the wild...he's gorgeous. Great action in the 1st shot Nick. As Roy says it's getting more difficult to find them over here. 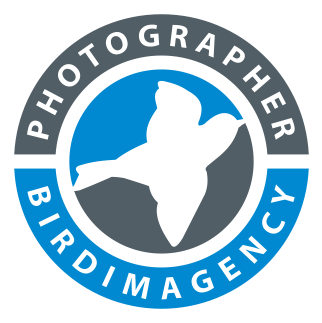 Hi Nick - you images of the partridge, the badger, the boreal are so crisp, and clear - great shots.